The Lich King encounter is a multi-phase fight and initially, there can feel like there is both a lot happening around you and a lot to remember. Due to this, and the fact I try to keep my explanations quite comprehensive, this guide will be a long one. Grab your tea / coffee (and biccies naturally). If you have any questions regarding our specific strategy, post them in the comments and I’ll be happy to answer them. The room is entirely safe to portal to without the risk of engaging the Lich King. To start this encounter, you have to speak to the NPC, Highlord Tyrion. This gives you the opportunity to have a good look at the room in which you’ll be working and to establish your positions before you begin. It also allows you to clearly see which section of the room will fall away in the later phases. This is quite crucial since any members of your raid stood on these areas will die if they don’t move fast enough (or don’t realise when or where to move to). The above screenshot shows the area in which you portal in. To the outer edge of the room, you’ll see a segment of the floor separated by a large icy crack (and marked on my screenshot with an arrow). This is the area that will fall away during certain phases of the encounter. It’s also the area where you initially tank and set up your raid. The above diagram shows our initial positioning of the raid for phase 1. We use a hunter misdirect on the pull allowing us to start DPS very early (while the tank is still positioning him infact). If you don’t have this luxury, be very aware of your DPS until the boss is correctly positioned. Pulling agro on the Lich King will drag him into your range DPS and healer camp and he has a frontal cone attack. Basically, you’re rather likely to wipe your raid. That said, this encounter has a 15 minute enrage so the faster you can get through phase 1 (which is very simple), the more time you can allow for the following, more complex phases. There is one primary ability that you need to be aware of in phase one. This infects a random member of your raid with a deadly plague. If this isn’t dispelled within 5 seconds, that raid member will die. Upon dispelling this disease, it will “jump” to the nearest target. The mechanic of this is to force the plague to jump to one of the many ghoul adds that will be up during phase one of the encounter. You don’t have long to react to and cleanse this disease which is precisely why we position our ranged DPS and healers so close to where the adds are tanked. As an elemental shaman, it may seem obvious, given this is a disease, to use a cleansing totem. Be aware however, that if your totem was to tick and cleanse the plague while your raid member is closest to another player rather than the adds, the plague will jump to them. As such, don’t give into temptation and leave the cleansing to the others. In simple terms, if you become infected by the Necrotic Plague then you move from your raid camp and position yourself just behind where the adds are being tanked (as shown above). For reference, they will be tanked facing away from you. At this spot, you must be cleansed and your plague will jump to one of the many ghouls. Move straight back to the raid camp and continue DPS. Both BigWigs and Deadly Boss Mods announce the Necrotic Plague very clearly. Remember to run instantly, there is no time to finish your current cast, this plague is nasty! Once everyone in the raid has adjusted to moving promptly with the plague, phase one should be very straight forward. 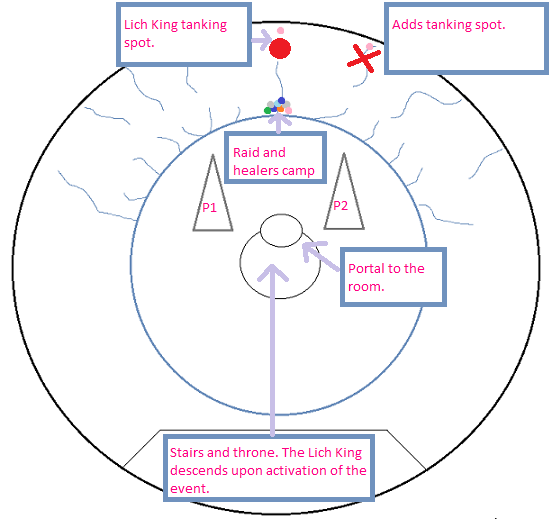 Prior to the phase 1.5 transition, the Lich King will run to the centre of the room. At 70% health, the Lich King will flee to the centre of the room and begin casting Remorseless Winter. This is a huge AoE spell that will inflict a lot of damage to anyone with in 45 yards range. Fear not, if you’re tanking on the outer edge of the room as per my suggestion, you’ll be out of range for this already. There are two main mechanics to deal with in this, relatively brief phase (one minute duration). These are large orbs of ice summoned at the Lich King (so in the centre of the room). They will target a random raid member and slowly travel towards them. Should they reach their target, they will inflict 10k frost damage and knock the player back and over the edge of the room. This player would be out of range for any combat res. On ten man, these are easily dealt with by one ranged DPS. We use a hunter. Every 20 seconds for phase 1.5 (meaning three times in total), a raging spirit will be summoned. This is a spirit duplicate of a member of your raid (so it spawns from them). DBM and Bigwigs will both announce who these spirits are going to spawn from. These are the DPS targets for this phase unless you’re assigned to the ice spheres. These spirits have a nasty frontal cone AoE called soul shriek. This will silence. As such, the spirits should be tanked in a specific spot to prevent your whole raid being silenced. 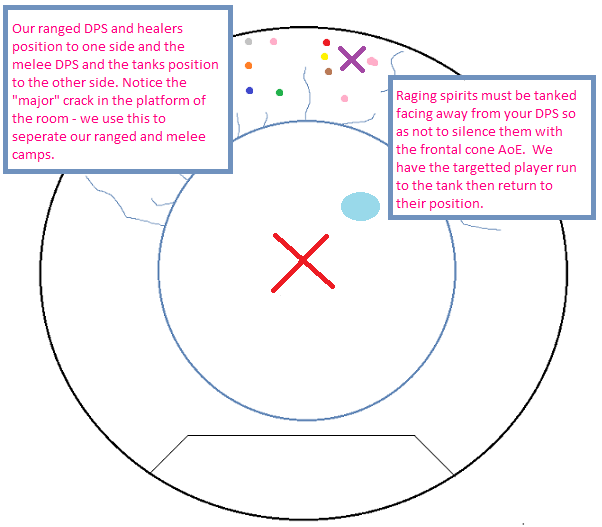 To ensure the shriek is controlled, we position our tanks (and melee dps) and the ranged and healers away from each other. As such, anyone marked for a spirit should run to the tank, wait for the spirit to spawn and then move back to their position before DPSing the target. Once the minute is up, the Lich King will kneel and begin to light the egde of the room, this will include the platform area you have been positioned on so far. It’s very clearly marked during the encounter (it glows), but you need to move into the centre of the room as the whole area will fall away. 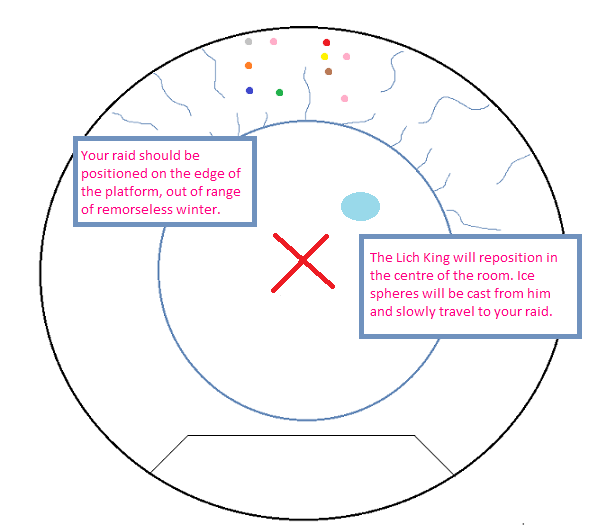 At the start of phase two, the outer edge of the Lich King’s room is going to fall away and you all need to move to him in the centre of the room. If anyone is stood on the edge as it falls, they will die and they won’t be in range for any battle res. You have been warned! 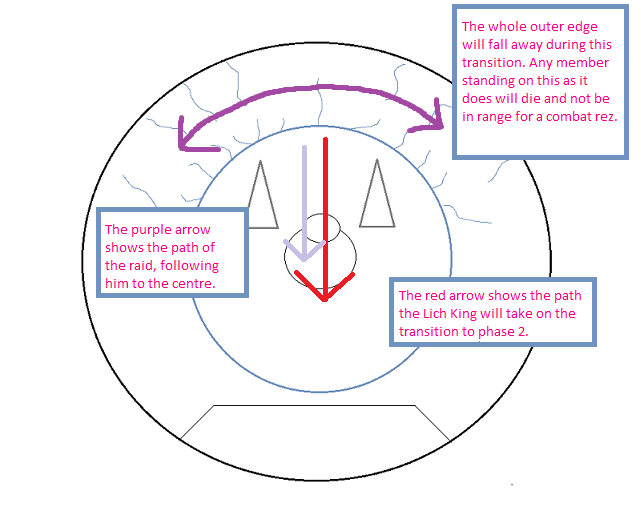 There are two main mechanics during this phase that you need to be aware of as ranged DPS. Defile is cast on a random player in the raid. It will place a large black puddle effect under that player which inflicts are 3k damage per tick. The damage is not the problematic part of this spell however. Every time someone takes damage from the defile, it will increase in size. Potentially, should a few players be hit by the defile, it will grow to such a size that the entire platform will be covered and your raid will wipe. We spread out before the defile is due to be cast. I’ll speak more about this shortly. The Lich King will summon a flying Val’kyr. This will target one random raid member, pick them up and fly towards the edge of the room. Should it succeed in reaching this destination before being killed, the raid member will be dropped over the edge of the room. Again, they will be out of range to be battle res’d. Before the val’kyr is summoned, we stack together in the very centre of the room. I’ll discuss this more shortly. The beginning of phase two will be signalled by the Lich King kneeling in the centre of the room. Your raid need to move to him as the outer edge of the platform (where you were positioned for phase 1 and 1.5) is going to fall away. Any member stood on there while it does will die and there is no option to combat res them back into the fight. Fast response on movement is imperative for the whole of this phase, beginning with this transition. If any ice spheres are still up, your ranged DPS need to throw instant spells at them and get them down as the raid are moving in. They have little health so it shouldn’t be a problem but do remember that ignoring them isn’t an option as they not only damage, but knock back their targets. Initially, the Lich King should be tanked in the very centre of the room as the first event you will encounter is the summoned val’kyr. On normal ten man mode, these have 450,000 health. They will pick up one member of your raid and head to the outer edge of the room, attempting to drop them over the side. Positioning all of your raid in the very centre of the room gives you as much time as possible to kill these and thus release your trapped raid member. They can be both snared and stunned but not rooted. We have a stun rotation for when these first spawn and then they’re snared with all DPS switching their attention to them. Who should be slowing the val’kyrs obviously depends upon your raid setup but be prepared to have frost shock ready. If you purely depend on one person to slow, the first time these are targeted by the val’kyr you may find said raid member dumped over the edge of the room very fast. In summary, if you don’t have frost shock key bound, ensure you do before you tackle this encounter. The second mechanic to deal with in phase two is the defile. Defile is cast on a random raid member and leaves a black puddle effect under that person. 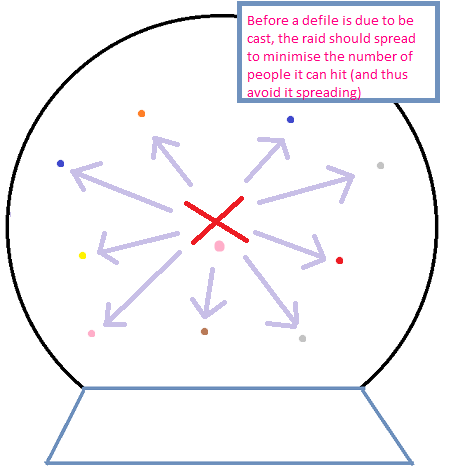 For every tick of damage any raid member takes from defile, the puddle will grow and can, potentially, engulf the entire room and result in a wipe. To minimise this occurring, we have our raid spread before the defile is due to be cast. This should ensure that no other raid members are in range to take damage and spread the defile. As soon as the defile is cast, you should be stacking again in preparation for the incoming val’kyr. Taking the above mechanics into account, phase two is a lot about the positioning of your raid. When the val’kyrs are due, you need to stack together as close to the centre of the room as you can. If a val’kyr targets someone stood right by the edge, you won’t have time to kill it before that person is thrown over. When defile is due to be cast, you need to spread out. Thus minimising the number of people that could potentially take damage from the spell. While this sounds simple enough, in practice these two mechanics can occur very close together and you may have defile and a val’kyr occurring within a second of each other. 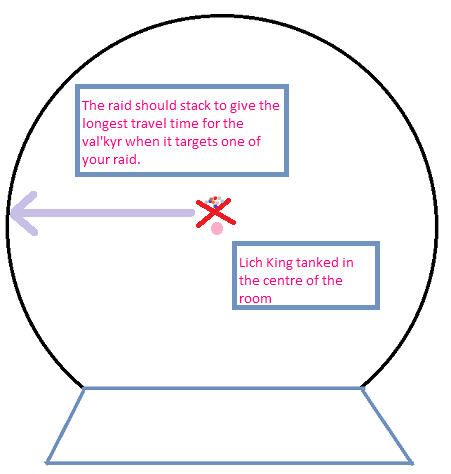 The placement of the raid for the val’kyr also has to be dynamic. 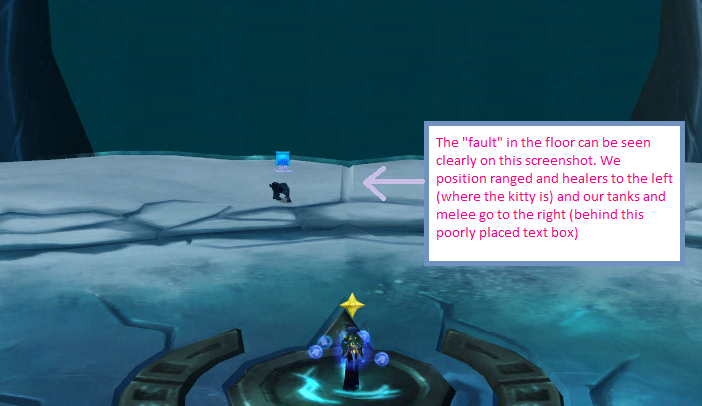 While you should try to keep the very centre of the room free to stack your raid for the val’kyr’s this doesn’t always occur and a badly placed defile can make this area void. In such an event, keep in mind which area will give you the longest DPS time for the add. 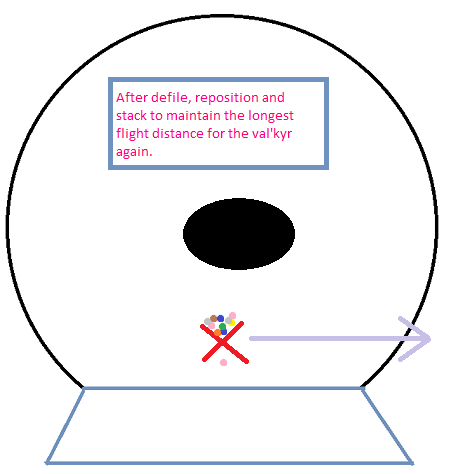 Moving your raid closer to the thrown (but still central on the y axis of the room) will still ensure the val’kyr has the longest flight time possible. The chances are high that you will have entered phase 2 with one raging spirit alive. This is the main DPS target until it is dead. They will still be casting the shriek and as such, will be tanked away from your raid. Due to this, you need the spirit dead so everyone can be stacked in the centre before the val’kyr’s spawn. Do not forget to kill that spirit before you switch your DPS to the Lich King. This phase continues until the Lich King reached 40% health. At this point, like phase 1.5, he will begin to cast remorseless winter and that’s your cue to leave the area. For reference, as we get close to 40%, we slow DPS to allow for the final defile. The Lich King is then dragged to the edge of the room (where the platform will soon respawn) and the raid stack there and DPS him down fast. This is to allow everyone to move back onto the platform and out of range of the remorseless winter as fast as possible. 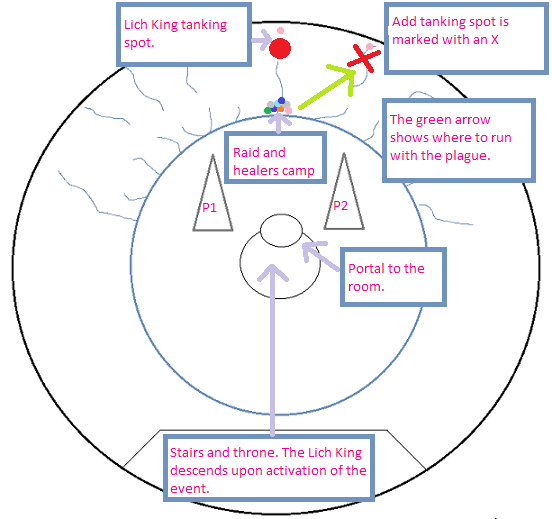 As the Lich King begins to cast remorseless winter, your raid need to move back onto the outer platform exactly like phase 1 and 1.5. Here, you will be safely out of range of the AoE damage. Once again, this phase will last a fixed one minute duration. Unlike phase 1.5, this time you will have four raging spirits spawn; one every 15 seconds. The more spirits you get down the better as carrying them over to the next phase is not ideal. As such, we pop heroism at this stage to help get as many of the spirits down before the transition as possible. After the minute duration of phase 2.5, the remorseless winter will end and again, the outer platform is going to fall away. Just as before, you need to move in as soon as possible and anyone lingering on the edge will die when the ground falls away. You can assume you will go into this phase with 1 or 2 raging spirits still alive and these should be DPS’d down as fast as possible. This phase still features defile but you will no longer get val’kyr’s. Instead, we have two new mechanisms for this phase. These are summoned spirit adds that spawn in the air. On ten man, you get ten of these spirits. They hover in the air for 30 seconds before charging down to the ground and towards your players. When they reach the players, they will inflict 14 to 15k shadow damage to all players within 5 yards. In conclusion, you have 30 seconds in which to try and get as many down or low in health as you can before they head towards your raid. As they’re in the air, this obviously lies with your ranged DPS. As an elemental shaman, your chain lightning is very useful on this phase. This spell targets a random member of your raid and teleports them inside frostmourne. Here you will find two NPCs, King Terenas (friendly) and a Spirit Warden (attackable). Healers can heal Terenas while he kills the spirit warden. DPS should DPS the warden down. The spirit warden will cast an interuptable, channelled magic debuff spell called soul rip. This does increasing amounts of damage. The defiles should be handled exactly the same as phase two so I’m not going to repeat that. The ideal situation is that all the vile spirits are dead before they begin to move to your raid. This depends a lot on your specific setup (the number of ranged DPS). We run quite melee heavy and as such, we usually have one or two spirits still alive as they begin to move towards your raid so we need a strategy for dealing with these. Firstly, when the spirits spawn, our tank moves the Lich King to the opposite side of the room to the floating spirits. This ensures our main tank won’t be taking unnecessary damage from these exploding spirits (in addition, nor will the melee DPS). Our ranged DPS then kill as many as they can before the spirits begin to move. They can be snared, so you can kite them through traps or earth bind totems should you need to. As the spirits start to head to the raid, move away from them (dragging them through the traps or totems if you choose too). DPS can still hit them and the damage of any stray spirits that do reach your DPS should be easily healed. 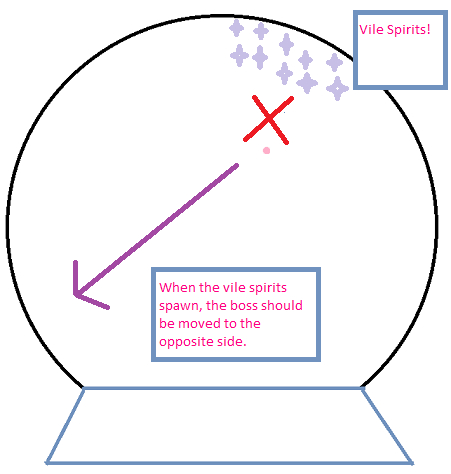 The next round of spirits will spawn soon after and the main tank and melee DPS should move again to the opposite side of the room. 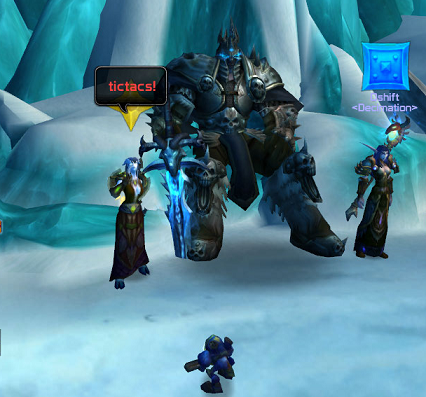 At 10% health, the Lich King begins casting Fury of Frostmourne. This will kill all members of the raid. It is a scripted event (that is to say, this is intended to happen). Do not release at this point. If you’re raiding with a demonology warlock or another elemental shaman dropping totem of wrath, this fight is perfect for glyphing your fire elemental. You can pop him in phase 1 and then again in phase 2 for maximum personal DPS. If you’re using totem of wrath, then your fiery buddy will come in very useful should you be ported into frostmourne during phase 3. Using it here will allow you to solo the spirit warden down very quickly and get out to join the fight again. Despite the fact that phase 1 features a disease debuff, the cleansing of this has to take place at a quite specific point. Using a cleansing totem could result in the debuff being passed to your raid members, so don’t do it. We save heroism for phase 2.5 when we have the most raging spirits spawn. Obviously, ask your raid leader for his or her preference on when to use heroism, but this is ours. The val’kyr guards in phase 2 must be slowed. Who does this obviously depends upon your own raid setup. We generally rely on our death knight using chains of ice but should he be the one to be targeted, myself and our enhancement shaman are always back ups with frost shock. Chain lightning is amazing for handling the vile spirits in phase 3, keep it handy! Good luck with this challenging encounter!